The natural beauty and rich cultural heritage of Thailand are major attractions for travellers from around the world and when combined with the pulsating nightlife of Bangkok you have a recipe for the perfect holiday. 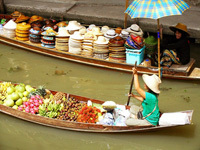 This tour includes bustling Bangkok, the dense jungles and picturesque waterfalls of Erawan National park and the unique historic and cultural site of Kanchanaburi and Ayutthaya. Thai Spice is a perfect introduction to Thailand and is perfect for anyone with limited time to spare. We start this tour in Bangkok with a full day tour of this amazing city. 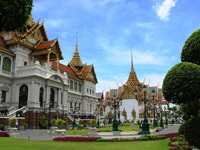 We include the major sites, like the Grand Palace complex and Reclining Buddha along with a boat ride around the ancient canals that criss-cross the city. There will also be plenty of time to enjoy the legendary nightlife of Bangkok, whether that's street food, dancing the night away or just a quick drink in one of the many lively bars. From Bangkok we head west to nearby Kanchanaburi to see the famous Bridge Over the River Kwai. You'll also take a ride on aptly named 'Death Railway' to visit the World War II cemetery. 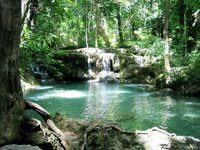 Erawan National Park is our next stop and here you will experience the natural beauty of Thailand with picture postcard waterfalls set amongst stunning jungle scenery. We now head back east to Ayutthaya, the once ancient capital of Thailand and now UNESCO world heritage site. The crumbling remains of temples and palaces make a fascinating place to explore and offers a unique glimpse into Thailand grand and opulent past. Finally we leave Ayutthaya behind and head back to Bangkok where we have time to explore the city a little more before we transfer you to the airport and your flight home.